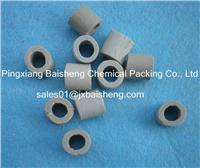 10mm ceramic rasching ring has excellent acid resistance and heat resistance, mainly used for chemical towers. Ceramic Raschig Ring has excellent acid resistance and heat resistance. It can resist to corrosion of various inorganic acids, organic acids and organic solvents except hydrofluoric acid, and can be used in high or low temperature conditions.